This edition focuses on East Africa! 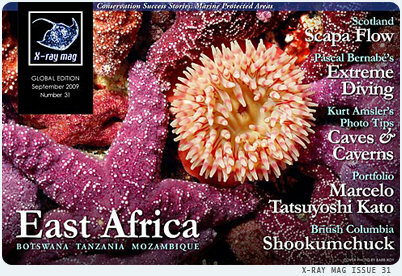 X-RAY MAG is an international lifestyle magazine for divers created by a group of seasoned dive media professionals. It is complimentary and published in pdf-format and distributed over the internet eight times a year. All issues are freely available. Back copies are also free to download. 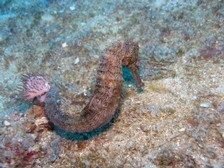 The content covers dive travel, environment and science, equipment, technical, sport and free diving, wrecks and conservation, profiles of interesting people in the field and underwater portfolios of underwater photographers. Issues number 31 is available for free download now. The full screen version (96 dpi pdf) has a size of 24 MByte. The basic version (low res - 72 dpi) has a size of 19 MBypte. Scott Bennett and Christopher Bartlett give us each their impressions of diving off Tanzania, Pemba, Unguja and Mozambique, while Tony White has close encounters with hippos, lions and elephants up the Okavango river delta in Botswana. Native photographer and prolific dive guide author of international acclaim, Lawson Wood, takes us around Scapa Flow -- a wreck diver's paradise on the Orkney Islands famed for the German Highsea fleet scuttled here after WWI. Pascal Bernabé talks us through the steps of preparing and executing an extreme dive such as deep cave diving. Rob Rondeau explains how to see wrecks with sonar and reflects on due respect for proprietorship of wrecks and artefacts. Arnold Weisz talks about the big new marine parks and the significance of conservation efforts in the Pacific, Scandinavia and Brazil. Kurt Amsler teaches us the delicate art of taking images in overhead environments. An artist with roots in Brazil and Japan, shares his portfolio of equisite paper sculptures and papercuts of marine life and coral reefs.